Fifteen years ago, Vista embarked on a journey to provide high-quality services to individuals and their families in the Central Pennsylvania area affected by autism. Meeting their critical needs requires an enthusiastic, talented, and dedicated workforce. To celebrate this milestone in our organization’s history, we are spotlighting staff members who started their employment with Vista in each of the 15 years. Jenn first learned about Vista after meeting the organization’s founding family, Mike and Deirdre Jarman, and their twin sons, Patrick and Sean, in 1998. 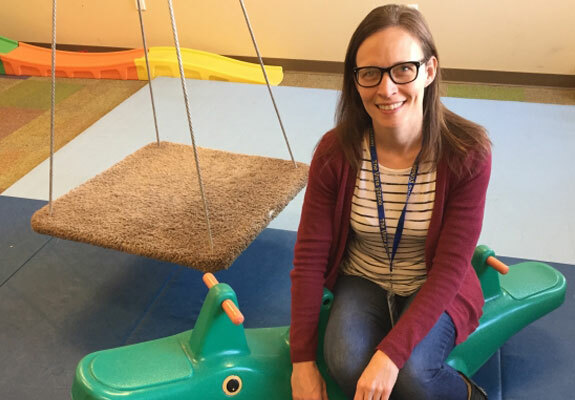 She knew immediately that she wanted to be involved somehow with their vision of opening a school and was also eager to get started in her Occupational Therapy (OT) career following her graduation from Elizabethtown College. Jenn had found her calling. While waiting for the Vista program to develop, Jenn accepted a position at Kennedy Krieger Institute in Baltimore, Maryland. Then in November 2001, she received the long-awaited message of “we’re ready for you” and immediately submitted her resignation to move back to the Hershey area and get to work at Vista. Throughout the past 15 years, she has held the previous roles of Behavior Technician, Occupational Therapist, Program Coordinator, and Outreach Specialist, and currently serves as the Occupational and Physical Therapy Department Supervisor to a team of nine. What was Vista like in 2002?